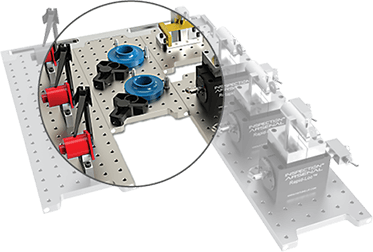 Phillips Precision, Inc. Products Division, Boylston, MA announces the latest in the uniquely designed, LEAN Inspection Arsenal™ product line – Modular Tower System for CMM inspection. Like other uniquely designed products of the Inspection Arsenal™, the newly offered modular fixture tower has features and benefits exceeding others on the market. First in the line of towers is a 2” interlocking system that can be built both vertically and horizontally. Cubes added horizontally, can be turned to any angle and locked securely. Choose from two preconfigured systems or order pieces individually. Watch for additions to the system along with the metric version! Inquire about custom sized systems. www.fixture-up.com.